Richmond’s collective waistline will expand this weekend with the return of the Greek Festival, six amazing chefs show off the goods at Off Broad Appetit, and over 60 restaurants will offer $3 samples this Sunday along Broad Street. Get your stretchy pants out Richmond because this weekend is full of good eats! The Greek Festival kicks off today, and if you’ve lived in Richmond for more than five minutes, you understand that it’s not only one of our oldest, but one of our favorite food festivals. There’s spanakopita, dolmades, gyros, moussaka, baklava, and of course Greek beer and wine. 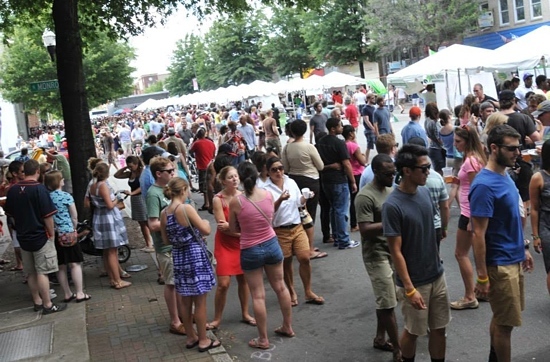 Note: that with this being one of RVA’s favorite food festival, there’ll be long lines. It’s also going to be a hot tamale of a weekend, so keep your patience level high–it will be well worth the wait! Rappahannock river seafood cocktail, smoked horseradish, avocado and shrimp crackers from Jason Alley. Foieffles, which are waffles with foie gras terrine from Ruben Garcia of ThinkFoodGroup and creator of minibar by José Andrés. American lamb sliders with smoked tomato jam and arugula/mint slaw from Adam Sappington of The Country Cat Dinnerhouse & Bar. Braised Denver Bacon Company bacon with spoonbread and local rhubarb from Justin Brunson of Old Major, Masterpiece Delicatessen, and Denver Bacon Company. Grilled sheepshead (it’s a saltwater fish) with rice grits, lemongrass, Vietnamese coriander, clam nuoc cham and sorghum seeds from Rob Newton of Seersucker. Strawberry candy, frozen coconut meringue, fizzy watermelon, fennel from Jason Alley. There’ll be wines from Barboursville Vineyards and Mouton Noir Wines, with Virginia craft beers also served. Off Broad Appetit takes place Saturday, June 1st at Pasture. Tickets are $125 per person. Only 125 tickets are available. After you Off Broad Appetit, then you can actually Broad Appetit on Sunday from 11:00 AM to 6:00 PM between Henry and Adams on Broad Street. There will be over 60 Richmond restaurants offering sample dishes for just $3 a plate. Come hungry and bring cash! Plan to spend a few hours grazing through the great food. If you prefer to plan ahead, check out the list of participating restaurants here. In local brew news, Strangeways Brewery is officially open. We stopped by last night for the kick-off event and to check out the nearly 8,500 square foot space located at 2277-A Dabney Road. They have two beers on tap at the moment, Albino Monkey, which is a Belgian white ale brewed with spices, and the Woodbooger, a Belgian-style brown ale. The brewery will release two other flagship beers in the next few weeks, along with a seasonal brew. In Restaurant openings, Michael’s Pies and Pints is now open in the old Racine location at 304 N. Robinson Street, according to Fan of the Fan. The restaurant has Neapolitan-style pizza, calzones, stromboli, soups, subs, and salads. Their temporary hours are from 4:00 PM to 2:00 AM. According to Church Hill People’s News, Sub Rosa is looking to reopen at the end of July or early August. So far, they’ve got a new roof, some new siding, and new chairs. Owners are excited to keep the momentum going and plan to throw a big re-opening party to help thank all the Richmonders who supported them after a fire forced them to close in early April.